Basuti Gerty Bolo grew up in Botswana, a landlocked country in Southern Africa with a population of 2.25 million (2016 – World Bank). As the world gathers in Vienna to celebrate the fiftieth anniversary of the first United Nations Conference on the Exploration and Peaceful Uses of Outer Space, Basuti will be given a presentation on “Space for women – the value of global networking”. This quotable quote by the great African American abolitionist and political activist, Harriet Tubman aptly captures the extraordinary life and journey of Basuti, an aspiring astronaut and a space science fanatic who is already doing great things in the field. Basuti’s dream and interest in space science was inspired by a picture of a Russian cosmonaut Yuri Gagarin who became the first human to travel into space. This was back when she was only in Standard five. “I used to look at the picture and vowed that I too will one day do the same,” said Bolo. 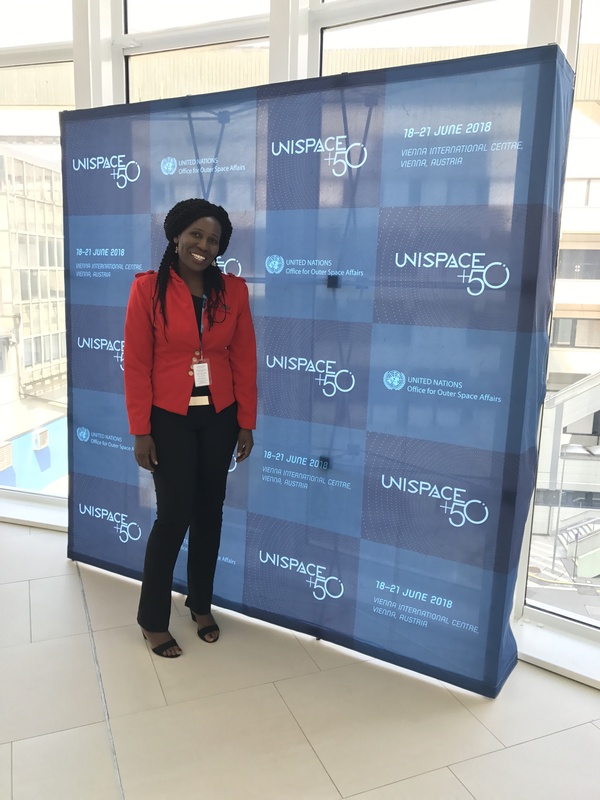 In this interview with Space in Africa; Basuti captured how her journey began and how she is getting involved in key policy making in the Space Industry. The first day I was attracted into space science was the first time I saw a photograph of the first man to go to the moon, Yuri Gagarin. I admired the picture and believed that one day I will do the same and explore the outer space. At that time, I was doing standard five. At school I used to love mathematics and science and being one of the best students. After I finished form 5 (Cambridge O- level certificate). I applied for a Piloting program but didn’t get any reply and I went to start a certificate in Agriculture in Botswana just to pass time still thinking of what to do next. 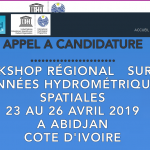 After I finished the certificate I was employed by the Ministry of Agriculture as Remote Sensing Technical Assistant and was trained again on a Technician certificate in Remote sensing and Cartography. Then later on I was sent for further studies to do BSc Hon Degree in Geographical Information Systems (GIS) and Remote Sensing at the University of Greenwich, UK. I returned and worked as Head of GIS Unit. Later on, another opportunity for scholarship came for a Postgraduate Diploma in Space and Atmospheric Science and I applied and got an offer. This is where I graduated a PgD in Space and Atmospheric Science at the African Region Centre for Space Science and Technology Education in English (ARCSSTEE) affiliated to UN and it is based in Nigeria. After graduating at ARCSSTEE I started networking and linking with anything space science. I applied for an MSc in Space studies, I was accepted and offered a third quarter sponsorship and I failed to get one quarter to sponsor myself. I didn’t give up. I searched for other offers until I got the online free NASA_ARSET program. I have been doing the programs online to upgrade myself. I also joined some volunteer work and membership on space in different organizations and groups such as Africa2moon, African Leadership Congress (ALC) Space Youth Forum, African Association of Remote Sensing of the Environment (AARSE), Institute of Electronics & Electrical Engineers (IEEE) _ Geoscience and Remote Sensing Society (IEEE-GRSS), Space for women etc. I have been contributing on space science national, regional and international including at the UN conferences, UN Expect meetings, UN High- level forums. I am a PhD student in Information System (specializing on Geospatial information systems) at the Botswana International University of science and Technology (BIUST), Botswana. My research is on the development of precise crop farming geospatial information system model based on traditional small-scale farming using Unmanned Aerial Vehicle (UAV) multi spectral imagery. This research is done under the supervision of Dr Dimane Mpoeleng of BIUST. The aim is to produce a framework that will provide farmers with precise information about their farms conditions for sustainable development. The UAV in use is the drone Phanton DJI. I completed my MSc in Information System and Data management at BIUST after developing geospatial information-based land quality evaluation model for crops under rainfed farming. This model can be modified to be used to evaluate land quality for any crop or plants by changing the factors. Space advocacy will help kids to pursue career in STEM in Botswana because everyone believes in what they see. Like in my situation I started by seeing an astronaut and admired and believed that one day I will do the same. What do you think Botswana can do to promote STEM education in the continent? Botswana have already started promoting STEM programs in the continent. The country organizes a show of STEM festival every year to encourage and motivate both young girls and boys to do STEM program. The program is also targeting girls to encourage them to pursue STEM program to reduce gender inequality. The festival is being attended by all national regional and Internationals. In addition to that the country has setup an International university (Botswana International University of Science and Technology) that specializes on STEM programs only. The university offers undergraduate and postgraduate programs. You will be giving a presentation on “Space for women – the value of global networking” at UNISAPACE – 50, could you share some of your ideas with us. Global networking for space for women is to sharing ideas and skills based on national, regional and global space issues, breaking of space boundaries of both a space science field and the physical borders. Networking helps in space awareness, provides access to opportunities, and empowers each other, formation of space for women committees and of global space for women policies. Networking strengthens and support national, regional and global space sectors. Global networking is to gain advice and support from experienced people and organizations. The general space activities in Botswana are the SKA project. Different astronomical trainings courses are conducted among SKA countries including Botswana is also active in the space applications; the use of Remote sensing applications and Geographical information Systems to manage different resources for sustainable development. Botswana is among the countries participating in the SKA Telescope project, how is this affecting the populace? The people are excited about the project. Botswana will be among SKA countries that will have an opportunity to have a space tourism based on watching things of the outer space, e.g. the stars, atmosphere etc. using bigger telescopes. There is an opportunity of the country to link with international space science organizations for support, sharing ideas and for strengthening the country` s vision and goals on space. To young girls willing to pursue careers in STEM I can advise them to go for the program it will open doors to their careers, they will have a choice to choose the course of their dreams. STEM programs are easy; all needed is focus and know what you want to be. They will meet challenges but those challenges are temporally. What they have to know is to see their end target being positive. They must remove failure, doubts and fear in their minds. Hard work is another important thing. Work hard to achieve better results. Final they must avoid negative people around them; they must follow their role models.